Volunteers from Verdiroc Development corporation spent the evening of April 16 aboard the Street Help Van operated by the Native Men’s Residence (Na-Me-Res). Two staffers and five volunteers distributed sandwiches, soup, blankets, clothing and personal hygiene items to homeless men and women in the downtown core. The shelter operates two vans seven nights a week, serving about 150 people each night. Ve’ahavta, a Jewish charitable organization, operates the van along with Na-Me-Res. Providing basic necessities of life and preventing hypothermia among the estimated 200,000 homeless residents of Toronto are the immediate goals of the program. Their ultimate goal is to build trusting friendships and assist in the transition to a shelter, the first step to self-sufficiency. Verdiroc staff and principals have participated in a number of community service days. “The suggestion for community service projects come from our staff,” says Cary Green, v-p of development for Veridroc. “These have included sorting food at the Daily Bread Food Bank and building houses with Habitat for Humanity. 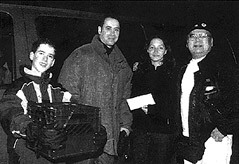 Green also presented a cheque to cover the cost of three evenings’ worth of supplies delivered by the van.